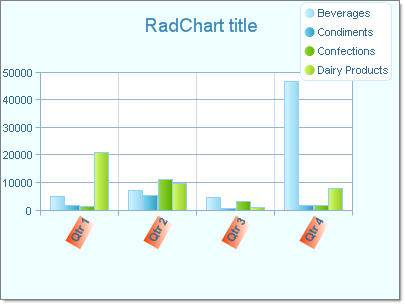 RadChart provides two collection editors: ChartSeries Collection Editor and ChartSeriesItem Collection Editor. They allow you to easily create series and items, and set the relevant properties without writing any code. Click on the RadChart Series property ellipses to display the ChartSeries Collection Editor. Here you can add or remove series in the Members list box on the left side of the editor. You can set the series level properties by selecting a series member and editing properties in the properties window located on the right hand side of the editor. See topics Series Overview, Series Items and Series-Specific Properties for more information. Note the Items property under the Series property category. 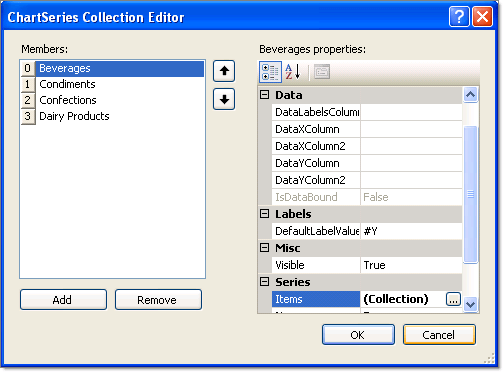 Click the Items property ellipses of a series to display the ChartSeriesItem Collection Editor. Here you can add or remove items in the Members list box on the left side of the editor. Select ChartSeriesItem objects in the Members list box on the left side of the editor. You can set item properties by selecting an item member and editing properties in the properties window located on the right hand side of the editor. 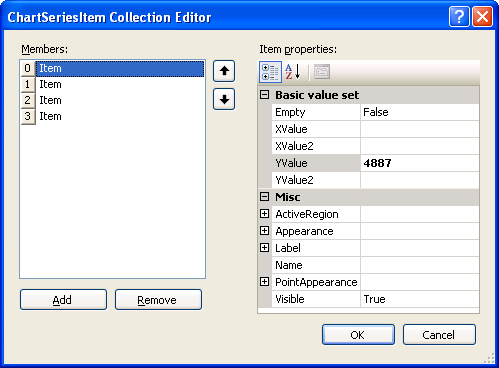 Set the values for each item using the properties under the "Basic value set" property category. See Series Items for more information. The running application shows ChartSeries members in the Legend and ChartSeriesItem as bars in the plot area. This chart example also displays customization in the legend and axis labels. See Legends and Axis Labels for more information.